Napa Earthquake: What About the Soil? – It's Wine By Me! Napa Earthquake: What About the Soil? Is this going to change the soil? Will more interesting Napa wines be made in the future? I’m not a scientist nor have I ever studied geology, but it would make sense to me, especially close to the fault line. While I haven’t seen this question answered yet, Smithsonian Magazine does start to examine Napa’s earth and how quakes have transformed the region into a spectacular place for growing grapes. Fault activity, as well as erosion via wind and rain, continued to break apart the many types of rocks around the valley, depositing their riches on the valley floor. The end result is the Napa Valley’s spectacular diversity of soil: over 100 variations, or equal to half of the world’s soil orders. In wine growing, soil diversity is extremely advantageous, allowing numerous grape varieties to grow in a relatively small area. In the southern part of the Napa Valley, for instance, the calcium-rich soil favors pinot noir grapes. 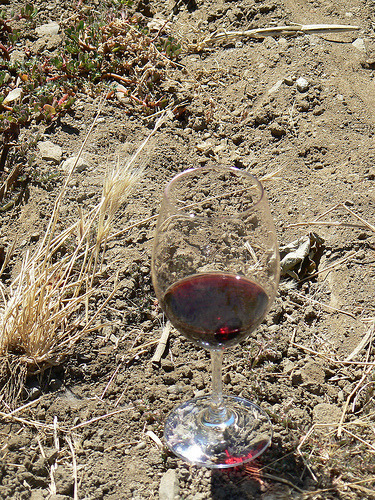 In the north, more volcanic soils help cabernet grapes thrive.